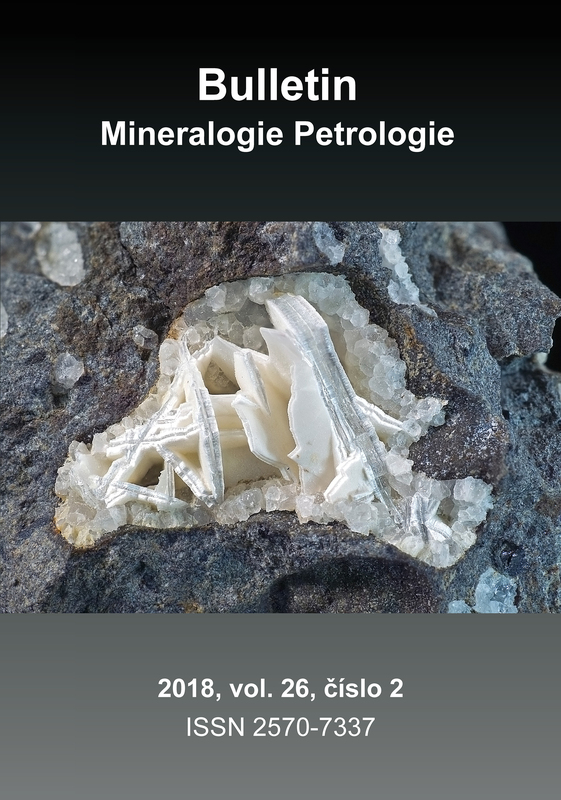 "Bulletin Mineralogie Petrologie" (ISSN 2570-7337 print, 2570-7345 online) has been established on 1 January 2017 through renaming as a successor of the Bulletin mineralogicko-petrologického oddělení Národního muzea v Praze (ISSN 1211-0329 print, 1804-6495 online) published since 1993. It is published simultaneously in printed and open-access electronic versions. It is published twice a year and contains high-quality original papers, brief research letters (including all necessary data) and review papers. The authors guarantee that the manuscripts published in the "Bulletin" was and will not be published in the same or another language in another specialized journal with the same or similar title, content and attachments. Exclusive copyrights for each language and any country are transferred from the authors to the publisher in case of admission to the print and subsequent publication of the manuscript. This copyright covers the exclusive right to reproduce and distribute published articles including reprints, microfilms, electronic media (including the Internet) or any other reproduction or translation. Manuscripts must be written in a clear and concise style in Czech, Slovak or English. The length of manuscripts (text including tables and pictures) should not exceed 30 pages (with about 400 words per page) for Original and Review papers, 10 pages for short Letters. Longer manuscripts may be accepted provided that their length is justified by scientific significance. Manuscript submission is recommended in electronic form to the editor: jiri_sejkora@nm.cz (up to 2 MB in one e-mail message), larger files can be sent via www.leteckaposta.cz or www.uschovna.cz or similar, or even by standard post on CD or DVD to the editor: Mgr. Jiří Sejkora, PhD., National Museum, Cirkusová 1740, 193 00 Praha 9 - Horní Počernice, Czech Republic. All received manuscripts are anonymously reviewed by at least two independent peer-review experts and their acceptance is solely dependent on their scientific quality. The manuscripts which are returned to the authors for revision after reviews are normally expected to be corrected within 1 months. Manuscipts must be prepared in the text editor Microsoft Word (version 2000); if other text editors are used, please save the final file in MS Word 2000 (if this is not possible, then in .rtf format). The text in the file must be aligned to the left, neither the manual hyphenation of the words nor the manual indent of the paragraphs should be used. The all manuscript (including headings, literature, etc.) should be written in one style (eg "normal") using the font "Times New Roman" and font size 12. Do not use PDF to prepare and send the manuscripts. On the title page of the manuscript state the Czech and English title of the manuscript, which must fully reflect its content. Also state the full names and surnames of all authors of the manuscript followed by the full addresses of their affilations (or residence) including postcodes. For the corresponding author, please also state the e-mail and telephone number (the phone is not published). Another part of the manuscript is an English abstract summarizing the most important results and conclusions of the submitted manuscript. The length of the abstract should not exceed 400 words (100 words for concise research). Include 4 - 8 keywords in English, separate the words with a comma. In the text of the manuscript, use the SI units (and their accepted prefixes) with the exception of structural (and X-ray) data for which use the unit Å (corresponding to 10-1 nm) . Use only IMA approved terminology and rules (especially mineral names, classification, etc.). The numerical data in the text (and tables) should be declared with a decimal point (13.9 km, 7.11 mol%, 25.63 wt% SiO2), for empirical formulae, it is necessary to indicate the brackets of the sum - fror example (Bi3.97Pb0.06Ag0.02)Σ4.05Te1.97S0.98. Write individual subtitle headings in lowercase. In the text body of the manuscript, do not shorten words: table, picture, year, photos; use shortening only in brackets (tab., fig.). Řídkošil T (1981) Zeolity a některé jejich vlastnosti. Kompilační práce k odborné aspirantské zkoušce, PřFUK Praha. Tables must be attached at the end of the manuscript. They will be insterted into the text during finalization, close to where they are first mentioned. Tables should be simple without manual text offsetting or manual word breaks (with unmerged cells, i.e. the same number of rows and the same number of columns) inserted directly into the WORD text editor, or tables in EXCEL format. Only high quality figures will be accepted. Attach the figures to the end of the manuscript, they will be pasted into the text when they are finalized, close to where they are first mentioned. If a figure is included directly in the manuscript, the identical figure must also be supplied in separate source files. Figures can be delivered electronically in file formats (for PC) *.tif, *.jpg (no compression) or *.cdr (for CorelDraw 11 or lower) formats. Sufficient resolution is required for the images due to the final printed format (300 dpi for photos, 600 - 1200 dpi for graphs). For macro / microphotographs (SEM, BSE, etc. ), give a graphical scale or word expression in the description of the image (e.g. apatite crystal with 5 cm length), not for example a 50 x magnification. For all photos, the author must be given, with field photos also include the year and optionally month when the photo was taken. Figures (photographs, maps, charts, etc.) can be printed in full color at the request of the authors. However, color printing requires authors to pay extra costs (2,500 CZK per print page or 5,000 CZK for 4 consecutive print pages). If you are interested in color printing please inform the editor - Mgr. Jiří Sejkora, PhD. (jiri_sejkora@nm.cz).